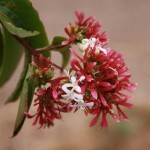 This is an open upright large shrub or small tree. The gray brown bark exfoliates, revealing darker brown bark beneath. The late summer flowers are white and fragrant, held on 6" long panicles. Sepals persist long after bloom, changing from green to rose-purple. Also called "Crepe Myrtle of the North". It will grow best in full sun. It will tolerate a range of soils as long as it is well-drained. Prune as needed for the desired form.